Black Truffle present the premier recordings of two recent works by legendary American experimental composer Alvin Lucier. Lucier has been crafting elegant explorations of the behavior of sound in physical space since the 1960s and is perhaps best known for his 1970 piece "I Am Sitting In a Room." He has written a remarkable catalog of instrumental works that focus on phenomena produced by the interference between closely tuned pitches, often using pure electronic tones produced by oscillators in combination with single instruments. Demonstrating the restless creative drive of an artist now in his 80s, the two recent works presented here both feature the electric guitar, an instrument Lucier has just recently begun to explore. In "Criss-Cross," Lucier's first composition for electric guitars, two guitarists using e-bows sweep slowly up and down a single semitone, beginning at opposite ends of the pitch range. The piece exemplifies Lucier's desire not to "compose" in the conventional sense, but rather to eliminate everything that "distracts from the acoustical unfolding of the idea." In this immaculately controlled performance of "Criss-Cross" by Oren Ambarchi and Stephen O’Malley, for whom the piece was written in 2013, a seemingly simple idea creates a rich array of sonic effects — not simply beating patterns, which gradually slow down as the two tones reach unison and accelerate as they move further apart, but also the remarkable phenomenon of sound waves spinning in elliptical patterns through space between the two guitar amps. 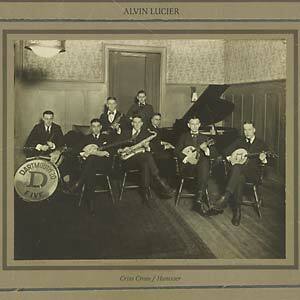 In the comparatively lush "Hanover," Lucier draws inspiration from the photograph on the cover, an image of the Dartmouth Jazz Band taken in 1918 featuring Lucier's father on violin. Using the instrumentation present in the photograph, Lucier creates an unearthly sound world of sliding tones from violin, alto and tenor saxophones, piano, vibraphone (bowed), and three electric guitars (which take the place of the banjos present in the photograph). Waves of slow glissandi create thick, complex beating patterns, gently punctuated by repeated single notes from the piano. The result is a piece that is simultaneously both unperturbably calm and constantly in motion. Out now on Black Truffle.